We met some very nice people in Cali. 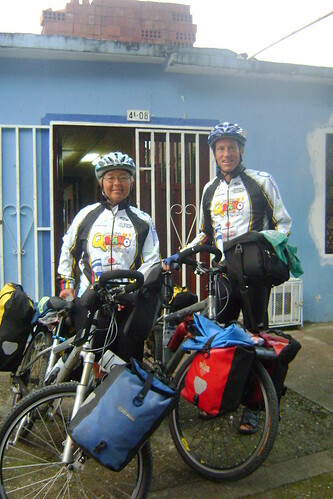 One of them was Jose Lopez (and his whole family), an excellent and active cyclist who has ridden the entire country on his mountain bike. Jose belongs to a group called Colombia Nuestra Meta (Colombia Our Goal), which does major country-crossing rides and raises money to get bikes for kids in remote villages. Last year, Colombia Nuestra Meta rode the entire route that we're riding (impressive!) and this year they're doing a route that's even harder, crossing all three mountain ranges that define this country, crossing it from east to west. Jose met us and gave us a grand tour of Cali, and then gave us two absolutely beautiful cycling jackets (shown in the picture) - the nicest we've ever had. Our job is to take a picture of ourselves in front of famous South American sites with these beautiful jackets. It gives us a good excuse to get more pictures of us together.